Perry is normally the one on breakfast duty when we want more than cereal and toaster waffles, but when he isn’t around I sometimes venture into the kitchen to try new breakfast items with Chance. Chance has recently taken to eating ground beef tacos so I thought I might be able to get him to eat eggs if I made them “taco-style.” We hit the jackpot here people! The first time I made these Chance scarfed down two and asked for two more. We usually have a surplus of eggs in our fridge which is super convenient so just to be stocked I keep tortillas and taco seasoning on hand too. These are super easy to make, and you can even get your little ones involved with the assembly of toppings. After all the tortillas are cooked dispose of any excess oil that may be left in the pan (do not rinse). Pour the beaten eggs into the same pan and scramble until cooked. Once the eggs are cooked through sprinkle the taco seasoning over them and shuffle the eggs around the pan until the seasoning is evenly distributed. 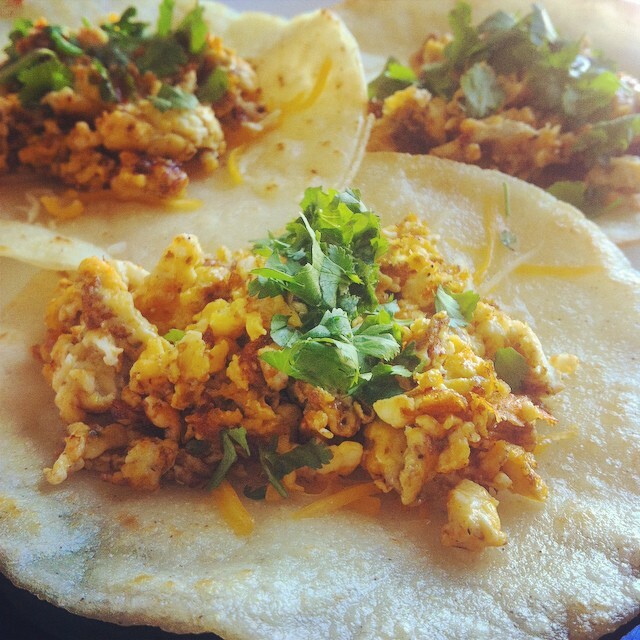 Scoop the eggs onto each of the tortillas and top with your favorite taco extras. *Photo and recipe are originals of my own. Please feel free to share this recipe but if you post it on another blog please give credit where it is due.